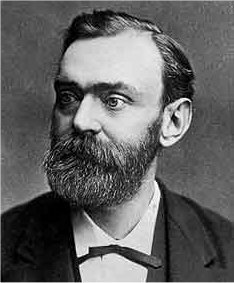 Alfred Bernhard Nobel was born in Stockholm, Sweden on 21 October 1833. When he was eight, the family moved to Russia, where his father opened a mechanical engineering workshop. His interest in science, especially chemistry, appeared at an early age. He did most of his studying on his own, never taking any college or university examination. He returned to Sweden in 1863 and began work as a chemist at his father's workshop at Heleneborg in Stockholm. In 1867, Nobel obtained a patent on a special type of nitroglycerine, which he called "dynamite". The invention quickly proved its usefulness in building and construction in many countries. The original form of dynamite was gradually replaced by gelatin dynamite, which was safer to handle. In that development, too, Nobel played a major part. Alfred Nobel wound up with a total of 355 patents, some more imaginative than useful, others both extremely practicable and valuable. He went on experimenting in pursuit of inventions in many fields, notably with synthetic materials. Income from the many enterprises all over the world in which he had interests made him one of the wealthiest men in Europe. Alfred Nobel was a lonely man and was often in poor health. He was very modest, often appearing shy to other people. Above all, he was engrossed in scientific ideas and in the practical management of his many European enterprises, and devoted himself night and day to his studies and work. His dream was to be of service to mankind. He lived in Paris for a number of years, but planned to return to Sweden and settle down for good at Karlskoga, where he owned property. On November 27, 1895, Alfred Nobel signed his last will and testament in Paris. Among its four closely-written pages, less than one referred to the donation which was destined to link his name with the supreme achievements of the modern world in science and literature, and the causes for peace. On 10 December, 1896, before the plans to move back to Sweden could be realised, he died at his home in San Remo in Italy. In January 1897 it was learned that he had left the bulk of his considerable estate to a fund, the interest on which was to be awarded annually to the persons whose work had been of the greatest benefit to mankind. The statutes of the foundation which administered the fund - the Nobel Foundation - were adopted on 29 June 1900.